The House rejected a GOP measure to pay furloughed workers but keep the government closed in a 222-195 vote. Six Democrats voted for the GOP measure, offered as an alternative to a Democratic bill to reopen the government. The Democratic bill, which would have funded the government through Feb. 28, is expected to be approved but is dead on arrival in the Senate. A vote on that measure will be postponed until next week...“While Democrats flail under their misguided leadership, Republicans continue to offer solutions. 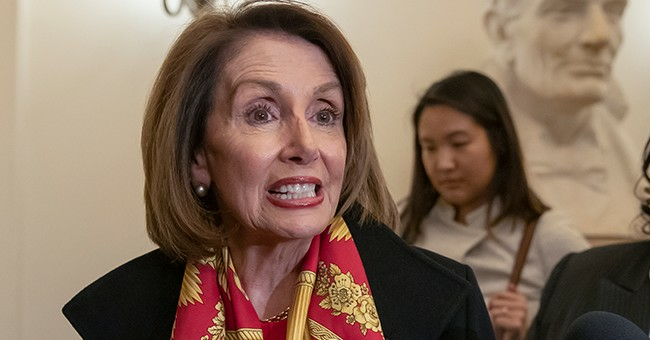 This time we are working to get federal employees paid and give Democrats time to negotiate an end to the shutdown,” a spokeswoman for House Minority Leader Kevin McCarthy (R-Calif.) said in an email to reporters. BREAKING: For second time in two weeks, House Dems (minus 10 defectors) defeat GOP effort to ensure federal workers from closed agencies — including furloughed — would receive their first paychecks of ‘19. Pelosi Inc. voted no. Because they just care so much! #TheMoreYouKnow ???? Democrats' top talking point throughout this entire partial shutdown has been the plight of unpaid federal workers. Many are living paycheck to paycheck, they've explained, and are therefore struggling to make ends meet during this political standoff. House Republicans responded by seeking a narrow method to pay these people. Nancy Pelosi and her party have now twice defeated these attempts, calling them "political stunts." I wonder if the government employees would be as dismissive of bipartisan efforts to pay them. What's useful about this exercise is that it's clarifying: In spite of their protestations and theatrics, Democratic leadership's top priority is not helping these workers. It's refusing to give in to Donald Trump's core demand that precipitated this standoff. That's an understandable position to hold for any number of reasons, but Democrats should be honest about it. The Hill-HarrisX poll found that 56 percent of voters aware of Trump's proposal believed that the president's offer should be taken as a "good faith" offer to start negotiations over a partial government shutdown that is now in its fifth week. Forty-four percent of respondents said it was not serious offer and that congressional Democrats should reject it. By a margin of 55-45 percent, a majority of independent voters said they believed Trump's proposal was something Democrats should consider to be a starting point.